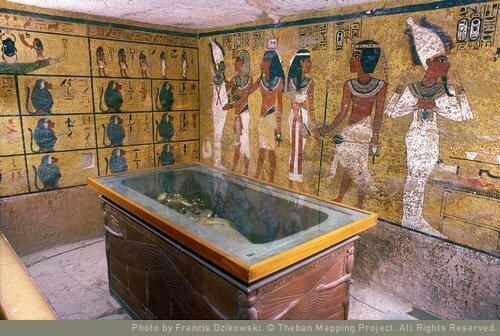 Description: KV 1 is a small tomb of typical late Ramesside plan, but with only one corridor, burial chamber, and a possibly unfinished room beyond. 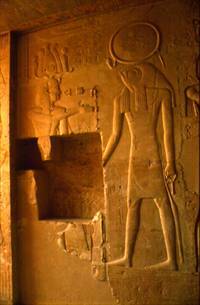 A pit on the floor of the burial chamber was covered with a large, hollowed block of stone to form the sarcophagus. History of Activity in the Tomb: The tomb has apparently been open since at least Greek and Roman times. 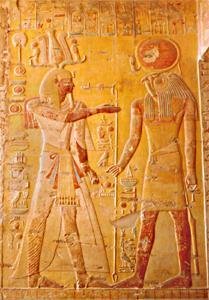 Description: KV 2, the tomb of Ramses IV, lies near the entrance to the Valley of the Kings. 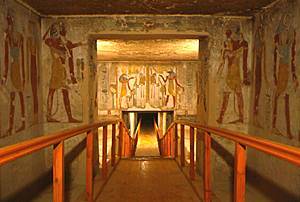 The tomb consists of gently sloping corridors, followed by an antechamber, a burial chamber, and auxiliary rooms beyond the burial chamber. 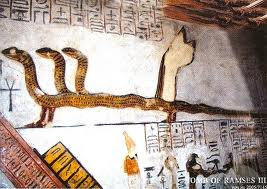 The original plan of the tomb was altered after the death of the King, and the room which would have been the first pillared hall was used for the burial chamber. 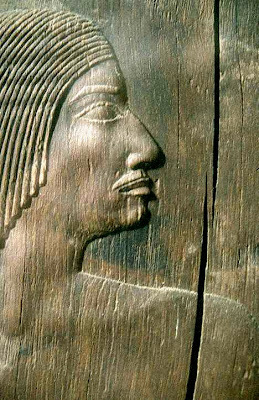 Entrance Corridor A has a disk with Isis and Nephthys, King's names on the jambs and thicknesses. 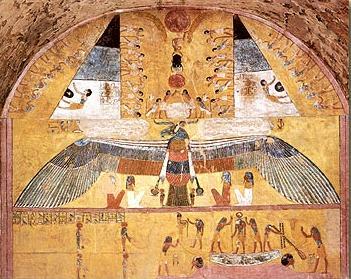 Corridor B has Kings' names with vultures, hawks, scarabs and winged sun disk on ceiling. Corridor C has Forms of sun god from Litany of Re on ceiling. Corridor D has Book of Caverns on walls, King's names and titles with stars on vaulted ceiling. Antechamber E has King's names and titles with stars on ceiling. 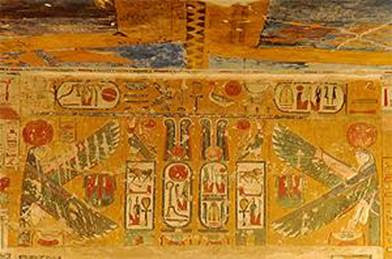 Burial Chamber F has Amduat, Book of the Gates, Books of the Heavens on the ceiling with decan lists. 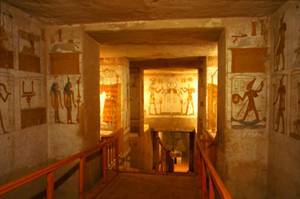 Chamber G has Book of Caverns, representations of funerary objects, King's names on ceiling. 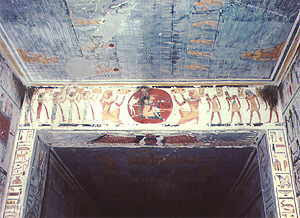 History of Activity in the Tomb: KV 2 has been open since antiquity and the tomb was used as a residence during the Coptic period. 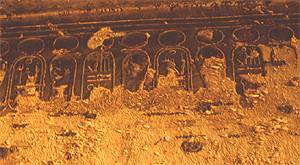 Description: KV 11 was begun by Setnakht, who completed the first three corridors, and completed by Ramses III, who added the side-chambers to Corridor C ,and finished the tomb through Chamber N and was buried there. 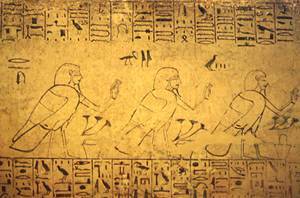 Description: The tomb consists of four successive corridors, followed by an unexcavated Well-Shaft, a pillared hall, and a burial chamber. 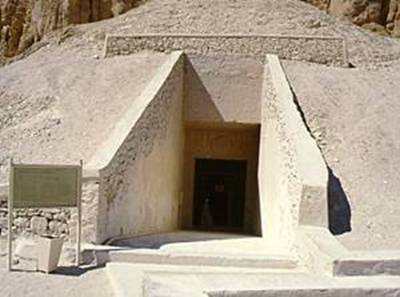 The first four corridors of the tomb are well-cut, but the Well-Shaft was left unexcavated, and a corridor which followed the pillared hall was enlarged to be used as the burial chamber. 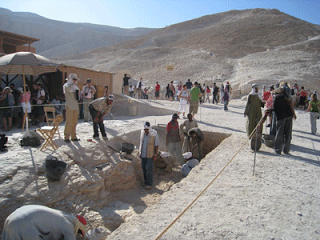 A pit to hold the coffin of the King was cut into the floor of the burial chamber. precedes a shaft (E) and next is the first pillared hall (F). The pillared hall has two columns in it and a side chamber (Fa) with two more columns and a niche. 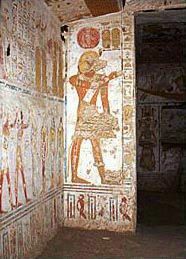 Two corridors (G, I) and a hall (H) come before the sunken Burial Chamber (J) with an arched ceiling and two rows of four square columns. 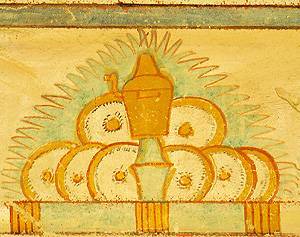 There are niches off of each corner of the burial chamber. A chamber (K) with it's side chambers opens up behind the burial chamber. 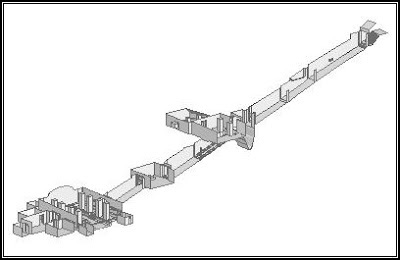 Description: A short open entry passage (A), extended outwards with a modern protective and three upper corridors (B, C, D) on an east-west axis lead to a well room (E) without shaft. This in turn opens into a room (F) with a central descent, but lacking pillars. A side chamber (Ga) opens off the south wall of the first lower corridor (G). After a second level corridor (H), the antechamber (I) beyond opens into the first burial hall (J1) with typical Ramesside vaulted ceiling over a sunken central floor flanked on each side by a gallery with four pillars and with shelves at the ends. Each side gallery has a small unfinished room (J1a - J1d) at each end. A descending ramp bisects the gallery platform on the entrance side while an axial passage at the level of the sunken floor divides the rear gallery platform, leading to corridor K1. This passage with its two side rooms (K1a, K1b), form the remains of an abandoned cutting for a larger second burial hall for which only one of the first quartet of pillars was cut free. A second horizontal corridor (L) leads to a completely cut second burial hall (J2), similar in form to J1 but larger, with ramps descending to the sunken central floor from both side platforms. An unfinished corridor (K2) continues westward on the central axis with a recess at each side, perhaps for the start of side rooms. Description: The tomb lies on a NW-SE axis, and consists of a short entryway(A), three long corridors (B,C,D), a well room without a well shaft (E), a pillared hall with a central descent (F), and a sarcophagus chamber adapted from an unfinished lower corridor beyond (G). The slope of the entrance and the following corridors is minimal. 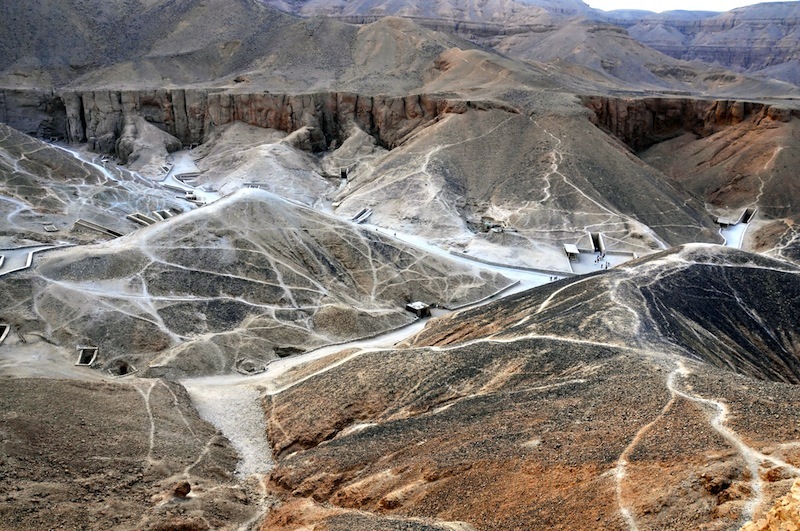 The tomb is 75.38 m long and 6.53 m deep, and it covers an area of 257.22 square meters. Description: The tomb extends on a north - south axis for 114.04 meters (374.14 feet) into the hillside to a depth of 13.12 meters (43.04 feet). The open-air entrance passage (A) has a central ramp with flanking steps fashioned of cut stone blocks set into the bedrock. 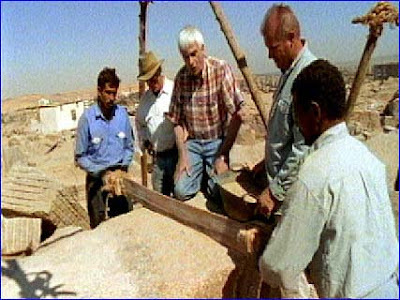 A wooden beam was placed beneath the lintel of the first gateway leading to the sloping first corridor (B). A level corridor (C) with a pair of beam slots for lowering the sarcophagus follows, succeeded by another sloping corridor (D) with a pair of rectangular niches at the end, a well room (E) without a shaft and a pillared hall (F) containing four pillars and a central descent but with no side chamber. Beyond the descent are two level corridors (G, H), and an antechamber (I) that leads through a passage with abandoned lateral cuttings for a burial chamber(J1). These are followed by the actual unfinished burial chamber (J2), containing a granite sarcophagus set into a roughly rectangular depression in the floor. 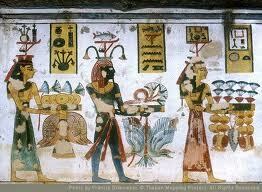 Description: KV 62 is a small tomb but it is known to all because of the treasures it held intact for over 3,000 years. It was discovered by Howard Carter in 1922. When King Tutankhamen died suddenly at an early age, the tomb that perhaps was originally planned for him in the Western Valley, at some distance from his grandfather Amenhotep III, was nowhere near completion. It may have been decided that the King would be buried in a tomb that was to be given as a royal favor to a high official (Ay) in the main valley. 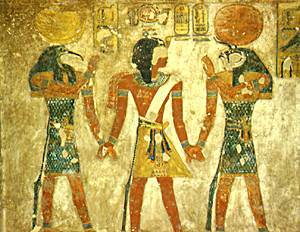 Ay later took the Western Valley tomb (WV 23) when he succeeded Tutankhamen on the throne. Sixteen steps led down to a sealed doorway covered in ancient stamps of ancient Valley guards. The first room reached after the flight of 16 steps and a descending corridor, the Antechamber, is similar to the pillared section of the burial chambers in other tombs. This room held between 600 and 700 objects. In the west wall of the Antechamber a low doorway leads to the Annex; it is equivalent to the storerooms off the sides of the pillared hall in traditional tombs. This was the last room to be filled before sealing the tomb. The burial chamber is sunken and separated from the antechamber by a rubble partition wall. The room held 300 objects in addition to the four shrines, sarcophagus, three coffins, burial mask and mummy of the King. 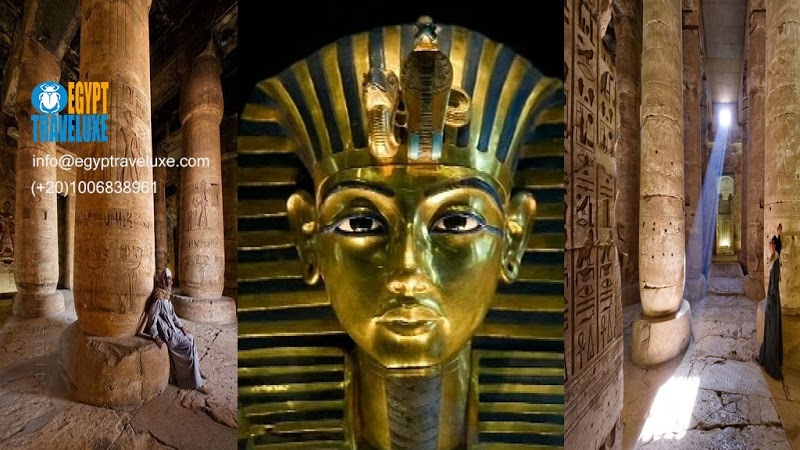 If you are interested to get a discount tour to the valley of the kings ,do not hesitate to contact Egyptraveluxe.com and get your discount please send the link of this post with your email .